”We are very, very satisfied,” the project manager says about the preliminary work on the DKK 21 billion conversion of the Tyra field. 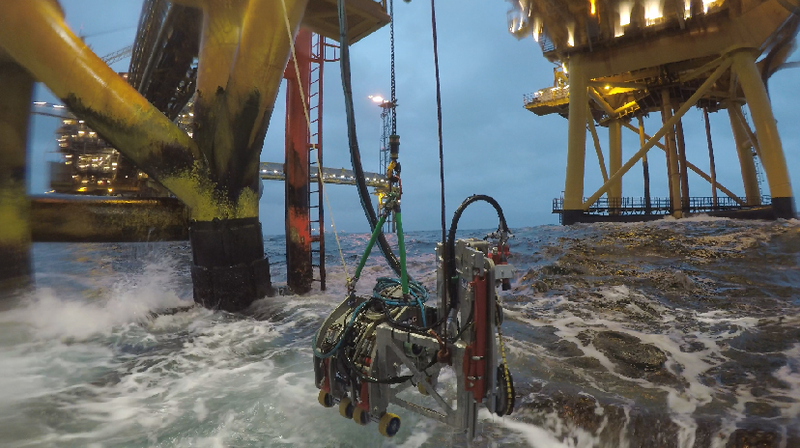 As part of dismantling the old topsides, an Esbjerg company has developed a robot that Total likes so much it has nominated it for an innovation award. It resembles the claw on a small excavator. But is so much more than that. The Remote Operated Vehicle is a remote controlled robot invented by the Esbjerg company SubC. The robot has solved an important task for Total, which is responsible for renovating the Tyra field. The platforms' spider decks were originally six metres above sea level but since Tyra has subsided, they are now very close to the water. The steel construction must therefore be cut away. This task is normally carried out by divers under very strict weather and wave height conditions. But the robot takes big waves, cold water and strong winds in its stride. It is remote controlled from up to 60 metres away by a team observing all the movements via up to six cameras. And the robot attaches itself, cutting through the centimetre-thick steel with ease using an innocent-looking ’diamond wire’ resembling a rubber ring. Previously, the work depended on good weather, calm water, divers, ships and a large set-up. Alternatively, men were suspended on long ropes, which could be dangerous. 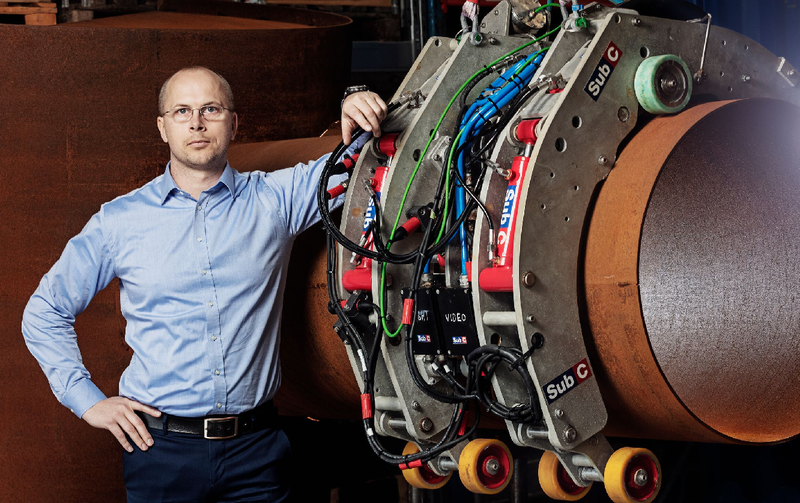 With its robotic invention, SubC can carry out the task easier, cheaper and faster with higher safety standards and more control, explains Rune Værndal, COO and Partner at SubC. ”We are all very proud of this,” says Rune Værndal, looking down at one of the four crawlers taking a break from the ocean and currently standing on a pallet on the floor at SUBC in the Port of Esbjerg. Here is Rune Værndal, COO and Partner at SubC together with the Remote Operated Vehicle - a remote controlled robot invented by the Esbjerg company. The robot was developed at the Port of Esbjerg as part of the gigantic Tyra project worth DKK 21 billion. The Tyra field has been in operation since 1984 and must be rebuilt. The layer of chalk under the field has subsided as the underground gas has been produced. That causes a risk of large waves reaching right up and hitting the platform itself. Rebuilding comprises several elements. New platforms must be installed though some parts of the field will be reused and are therefore being renovated. This entails the old topsides being lifted off and the wells being extended by about 13 metres. Finally, new topsides will be installed. Altogether, the renovation will mean increasing the distance down to sea level enough for the platforms to work safely for decades to come. Morten Hesselager Pedersen is Vice President, Head of the Tyra Redevelopment at Total, and is responsible for the entire Tyra project. On the telephone from Doha, on his way from Kuala Lumpur, he praises the robot. ”It's a real success story, and we've nominated the project for the Total Annual Innovation Award,” he says. ”It's the result of some engineers' courage and flair for challenging the way we do things,” he says. Since the final decision to convert Tyra was made in December 2017, hundreds of people have worked on the conversion. One of the challenges involves dismantling the old platforms. The robots are helping with that and other tasks. However, Morten Hesselager Pedersen has also been in Malaysia and Indonesia recently to look more closely into manufacturing the new topsides. Meanwhile, the platform containing the crew quarters is being made in Italy and new jackets are being built in Cadiz in Spain. 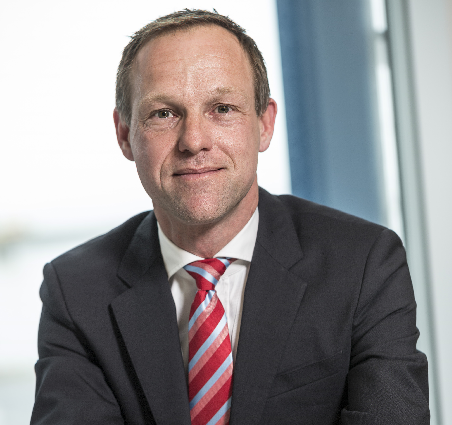 ”We have 75 people stationed around the world to keep an eye on ensuring that the new platforms are as expected and planned,” explains Morten Hesselager Pedersen. And they are. Not just the dismantling in the North Sea but also the building work is on schedule. The project manager is therefore pleased to note that they are actually slightly ahead of schedule. ”We are very, very satisfied so far,” he says. This means that the ”first steel cut”, which is the opposite of a topping out ceremony when the roof of a new building is completed was carried out at all three locations in 2018. The rest of 2019 will be taken up with building, cutting and preparing so that 50,000 tons of steel can be removed from the site. In 2020, the biggest crane vessel in the world, Pioneering Spirit, will arrive. With one lift, it can remove Tyra East, the crew quarters and process module, which on its own weighs 15,000 tons – the same as 10,000 cars. It can do the same with Tyra West, which weighs 7,000 tons. ”Pioneering Spirit will lift it and sail it to shore in Frederikshavn, where it will be cut up and more than 95% reused. We made sure of that in the tender documents,” explains Morten Hesselager Pedersen. Alternatively it could be cut up into small chunks and transported to shore in containers. A far more expensive and more complex project. Basically, the platforms were designed with installation and operation in mind much more than dismantling, so it was not clear from the outset if this would be possible. ”15,000 tons in small containers. Phew, that wouldn't have been easy,” says Morten Hesselager Pedersen. Part of the current work is also to maintain supplies while Tyra is closed down. This means gas can be exported from other gas fields during the period. That required new underground pipes being laid. This is how the Tyra field will look once it has been rebuilt. The picture is a digital visualization by Total. The biggest milestone this year will be on 1 November, when Tyra closes for good. This process will begin on 1 April – one well at a time. During the summer, the pipelines will be cleaned and isolated, and one by one the 50 or so wells will be closed down. On 1 November the field will close completely. That day will mark 35 years with the platforms. ”It's a job tinged with nostalgia and Danish history. After all, it's been a second home for many people since 1984. Tyra has played a special role for Denmark,” says Morten Hesselager Pedersen. The project has 1.5 million offshore working hours that are currently being used up. For the next 12-15 months, preparing for the replacements and the dismantling will be in focus. ”This will all culminate on 25 May 2020, which is when the company tasked with replacing the platforms will arrive. We must be ready for that,” says Morten Hesselager Pedersen. According to him, the key to success is the ability to plan with incredibly high predictability. The many building blocks must fit together and be carried out very precisely to fit in with the planned times. Otherwise, everything will slide. ”It's like building a house on a huge scale. If one craftsman is delayed, the next can't get started. It becomes difficult and expensive. So far, I'm happy that we've managed to benefit from the enormous amount of preparation work before the decision to invest itself,” says Morten Hesselager Pedersen. The project is off to a flying start, but according to Morten Hesselager Pedersen, the next challenge will be to keep our eyes on the ball and remain focused on keeping on track. The conversion of Tyra is the first time a project of such a caliber and scale is being carried out. Not just in Denmark, but worldwide. The so-called decommissioning of existing production platforms, i.e. removal of existing constructions, has not been attempted before. In this context, the offshore oil and gas industry is not a very old discipline. ”We haven't attempted this before, and because the facilities have been modified in past decades, the task has become even more difficult,” says Morten Hesselager Pedersen. That is one reason why Total contacted the Esbjerg company SubC. Though the task was not to design a robot. Total had to investigate the stability of the legs and wanted to hear whether it was wisest to measure the thickness of the original jackets with the help of divers or men suspended from long ropes. So-called rope access. Instead, a dialogue with Total about the robot began and a prototype was soon ready. Since then, the robot has gained a saw and can also saw up and remove the spider decks. This was a perfect assignment for SubC. It works both above and below the water line and in the critical zone right between the two elements. ”When oil prices are high, tasks simply have to be solved here and now. Now that prices are fluctuating, more thought goes into how a task can be solved best, and that's where we come in,” says Rune Værndal. Many of SubC's 65 employees are engineers. ”Working with Tyra involves absolutely fascinating engineering work. It's fantastic sitting here in the Port of Esbjerg and helping to make a difference on Tyra, 225 kilometres out in the North Sea,” says Rune Værndal. The robot project runs into tens of millions of Danish kroner, but the idea is to introduce the robot worldwide. The project of converting Tyra is expected to be complete in 2022. The conversion means that Denmark can remain self-sufficient in terms of gas for many years ahead. - 90% of Denmark's gas production is processed in the field. - Operated by Total on behalf of DUC. The end of 2017: Finally, the decision to rebuild was made. 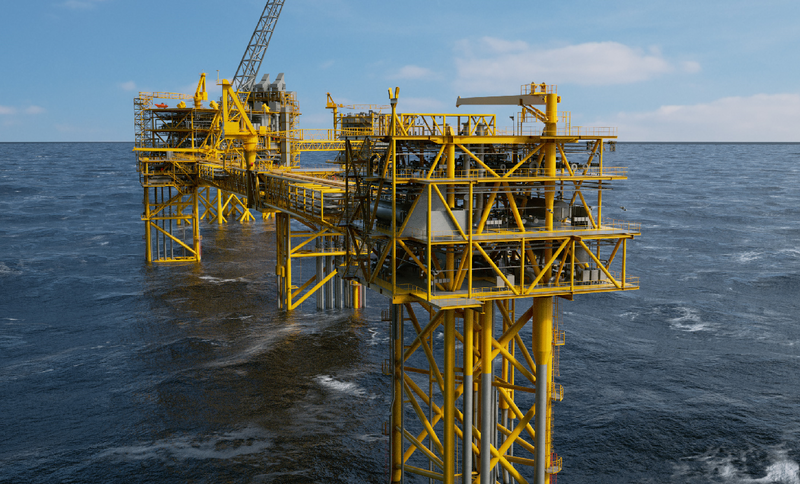 Total has two partners for the project: Nordsøfonden and Shell. 2017-2019: The major task of preparing the platforms for closing down production and preparing them for collection by the crane vessel. Extensive engineering and building undertaking. Fourth quarter of 2019: Tyra's production will close. The closure will begin in early 2019 in stages with a clear focus on safety and operational efficiency. 2020: The six new topsides for the well head and raiser platforms will be finished and sailed out to the field. 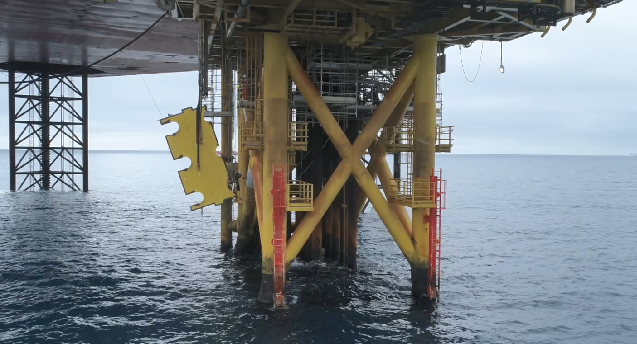 First, the topside will be lifted off and lowered onto a transport vessel while the new one is installed on the existing jacket with an extended well. And so on, until all six topsides have been replaced. 2021: Installation of the new process facility and new crew quarters platform. The crew quarters will be positioned 100 metres away from the oil and gas installations for safety reasons. Today, the process and crew quarters on both Tyra East and Tyra West are combined as one module. 2021-2022: The existing process facilities and crew quarters will be removed and disposed of in accordance with legislation in the area. The platform on Tyra East weighs 15,000 tons. 2022: The new Tyra field will open and gas production will resume. Before that, the facilities will be made ready and comprehensive training programmes conducted to ensure that employees are ready to use the new technology and can operate the equipment safely and efficiently.